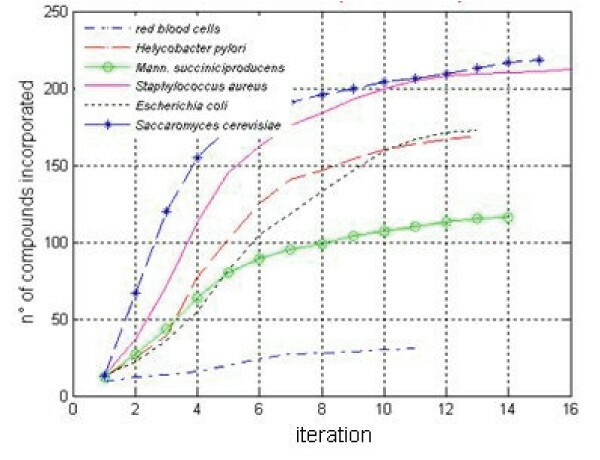 We propose a Petri Net-based method for metabolic networks profiling with respect to specific environmental conditions, based on the concept of metabolic reactions hierarchical ordering considered in . One or more metabolites are seeded in the network, then the newly synthesized compounds are iteratively integrated in the system until no new compounds could be synthesized, breeding a process of metabolic network expansion. At each step t of the network expansional process the method identifies the subset of metabolites s(t), also called "scope", that could be synthesized from the compounds available in the step t-1. The size |s(t)| of each set s(t) could be used to derive absolute and relative expansion process profiles, describing both the total number of compounds progressively incorporated and the number of new compounds synthesized in each algorithm step t.
The absolute profiles of the expansion processes obtained seeding glucose as nutrient in the metabolic networks of red blood cells, Escherichia coli, Mannheimia succiniciproducens, Helycobacter pylori, Saccaromyces cerevisiae and Staphyococcus aureus are depicted in Figure 1. 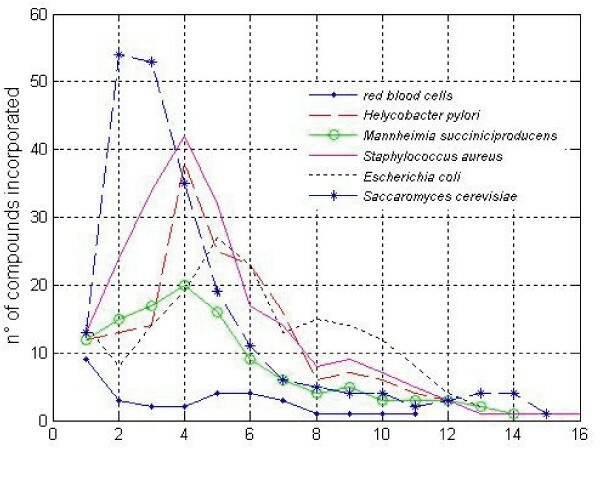 The qualitative trend is similar in all the metabolisms, with the exception of red blood cells network. Profiles are characterized by a rapid incorporation of compounds in the first iterations, while in the terminal steps the size of the metabolite subset reaches a saturation, since unavailable factors are required for the synthesis of novel compounds. Absolute profiles of the expansion process obtained seeding glucose and co-factors. On the x-axis we report the generations (steps of the algorithm), whereas on the y-axis we report the cumulative number of the biochemical compounds incorporated. The relative profiles of the same expansion processes, depicted in Figure 2, show the relevance of each algorithm step, allowing the identification of those steps in which a large number of compounds are synthesized. This is possible thanks to the incorporation of compounds called "metabolic hubs". Relative profiles of the expansion process obtained seeding glucose. Since natural selection acts on every structural entity of life, as it has been proven from genomic and proteomic sequences analyses, it is plausible to suppose that biological networks' structure is selected through evolution, and we prospect phylogeny approaches based on networks comparisons. In this direction the definition of a similarity metric between metabolisms based on the symmetric version of the Kullback-Leibler distance among probability distributions, applied on the profiles obtained using the method here proposed, is a promising research topic.